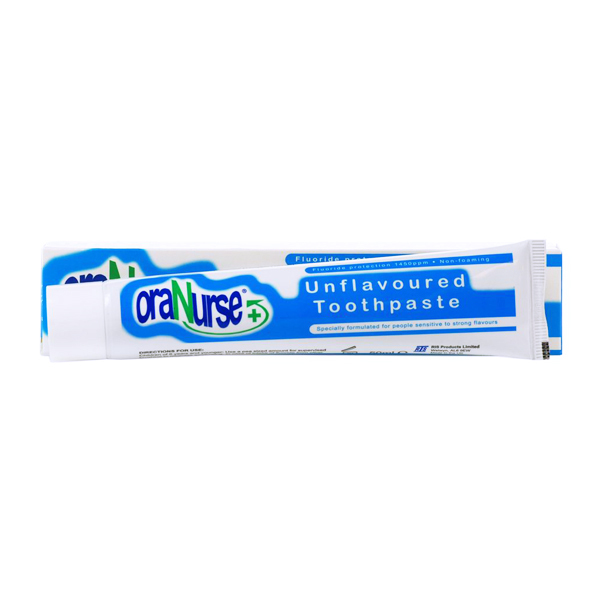 OraNurse is an unflavoured toothpaste specially formulated for people sensitive to strong flavours. It has 1450ppm fluoride and is SLS free (non-foaming). OraNurse Unflavoured Toothpaste was initially developed in a response to the need of autistic children who have a problem with taste, even to the extent of not liking the taste of water. This has resulted in the development of a paste with no flavour or sodium lauryl sulphate but still with the protection of 1450ppm fluoride. ï¿½ People who simply donï¿½t like the taste of mint. ï¿½ Adults and children with learning disabilities where they perceive mint to have a ï¿½hotï¿½ or ï¿½burningï¿½ sensation. ï¿½ Patients with sore mouths as a result of head and neck radiation. ï¿½ People that have an intolerance to Limonene.